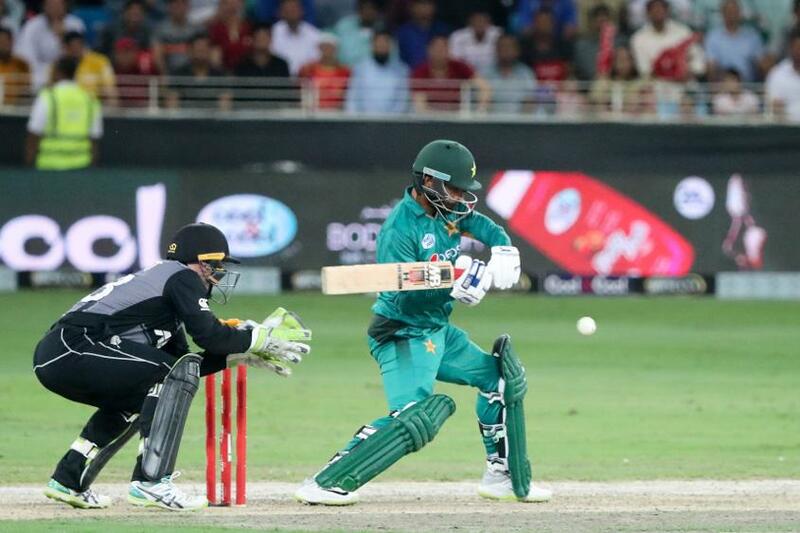 Pakistan completed a 3-0 clean sweep in the T20I series against New Zealand, as Babar Azam and Mohammad Hafeez hit 50s in their 47-run win. Azam continued his sensational run of form in T20I cricket with an excellent 79, marking his fifth half-century in eight innings in the format. He passed the milestone of 1000 T20I runs during his knock, doing so in 26 innings, the quickest of all time. Hafeez scored an unbeaten 34-ball 53 to help Pakistan to 166/3 which proved too steep for their opponents. Kane Williamson amassed 60 in breathtaking style, temporarily threatening to make a game of it, before a brilliant display from the home side's bowlers induced an extraordinary collapse and made sure New Zealand finished the series winless. Having won the toss and elected to bat first, Pakistan made a shaky start to their innings. Fakhar Zaman (11) scratched around for runs unconvincingly and struggled to find the middle of the bat. That is a stunning collapse! After 12 overs, New Zealand were 96/2, and closing in on victory. Less than five overs later, they've been bowled out for 119. Tim Southee (0/30) bowled with excellent precision, albeit fruitlessly, and he was backed up by Seth Rance (0/22) who did an excellent job of starving Pakistan of runs in the opening exchanges of the match. Lockie Ferguson's (1/29) dismissal of Zaman in the sixth over prompted a change of impetus amongst the batting side, as veteran all-rounder Hafeez came to the crease with a more positive mindset, thus allowing Babar to bat with more freedom also. When Ish Sodhi got carted for consecutive sixes in the 11th over, it looked as though the floodgates may open, and those in attendance might have expected a display fitting of the side ranked number one in the MRF Tyres T20I standings. What actually ensued was a period of relative calm, as Williamson turned again to the experience of Southee, alongside the express pace of Ferguson. Three overs without a boundary left Pakistan once again frustrated and relatively stagnant on 95/1 after 14 overs, New Zealand's seamers plugging the run-flow for a short period. Babar then switched gears, slapping Colin Munro (0/21) for two massive, straight sixes, shortly after completing his fifty. Ferguson could not replicate his earlier exploits, dragging two balls short to the imperious Babr who put them both away to the fence in style, before Colin de Grandhomme (2/41) capitalised on Azam's keenness to up the rate, duping the in-form batsman into a big shot with a slow off-cutter and sending him back for a dominant 79. Shaoib Malik chipped in with a useful cameo of 19, including three fours, and Hafeez continued to attack, eventually finishing with a highly entertaining and unbeaten 53. Considering the two brilliant knocks, and in the climate of today's T20Is where 180+ can be a par score, one might have thought that Pakistan could have made more runs given their wickets in hand. On a lagging pitch however, and against a side who had not reached the 160-mark in this series thus far, Pakistan will have rightly been delighted with their total. New Zealand made a dreadful start to their run-chase, with Munro playing an unsightly heave to Faheem Ashraf in the second over and seeing his middle peg rattled. The tourists then stooped to 13/2 when de Grandhomme was run out, Usman Khan with an impressive direct hit. Glenn Phillips and Williamson then began to rebuild for the hosts, the latter in particular really taking it to the Pakistani attack with a plethora of wonderful cricket shots. New Zealand's star batsman brought up his fifty in the 11th over in fitting style, launching a straight six to reach the milestone in just 30 deliveries. The away side were ahead at that stage, but when Williamson holed out to long-on for 60, the game changed, and a collapse of 8/23 in 29 balls was set in motion. Phillips (26) fell just two balls later, Shadab Khan's (3/30) devilish spin the comeuppance of both batters, before New Zealand lost three wickets in three balls, two of them courtesy of Imad Wasim (2/28), and the third a run-out in the following over. New Zealand's middle-order and tail showed no resolve whatsoever, as Shadab bagged another. On debut, Waqas Maqsood (2/21) picked up two scalps to round off proceedings, and 95/2 had suddenly turned into 119 all out. This Pakistan side are a force to be reckoned with.